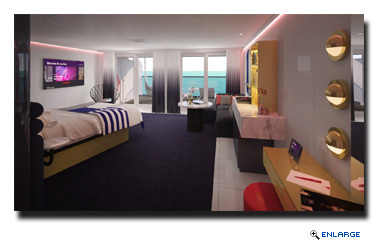 Cruise Talk: Virgin Voyages Reveals RockStar Suites CruisePage.com - Discount Cruises, Last Minute Cruises, Cruise, Cruise Line, Cruise Vacation. RockStar Suites Sailors will live their best lives all taken care of by the RockStar Services Crew, from time of booking, to sail away and throughout their voyage. There will be backstage access for RockStar Suites Sailors at every corner, with early access to onboard entertainment, restaurants, Shore Things, a private transfer to and from the ship in Miami and an exclusive express VIP pathway to the ship during embarkation. RockStar Suites Sailors will have their very own wardrobe team to help unpack and repack, complimentary pressing service and nightly express swimsuit drying service-- because no rockstar should ever have a wet bottom. All RockStar Suites Sailors will have access to Richard's Rooftop, their very own private members club-- a secluded place for them to bask under the sun or have a drink under the stars. There are only two Massive Suites aboard the Scarlet Lady, with each suite sitting atop of the ship’s bridge. These 2,147 square foot suites, are a place that legends dream of-- each with its very own music room, which seconds as an extra bedroom that is stocked with guitars and an amplifier. At the center of the Massive Suite is a circular oversized couch set up, perfect for conversation and cocktails from the suite’s adjacent in-room bar. Rockstars can primp for an appearance aboard the Scarlet Lady in the suite’s glamorous bath and dressing room area complete with a hot tub, vanity area, two full-sized wardrobes and a marble-clad bathroom with a Peek-a-Boo shower area that overlooks the bedroom and out to the ocean. The Massive Suite’s larger-than-life terrace will be where friends, family and groupies alike can enjoy a private hot tub, a Peek-a-View outdoor shower, a circular conversation pit, a lookout point with stargazing loungers and two full length hammocks. Sailors in the Massive Suite can climb a staircase to the top of the runway outdoor table for dining and dancing in full rockstar glory.